Mattel issued an All That Jazz Reproduction in 2006. This ensemble is very hard to find and when found can be very expensive. The dress has a sleeveless bodice and a dropped waist with a knife pleat skirt. The coat is lined with matching bright green nylon and has a gold metallic belt that is VERY hard to find. 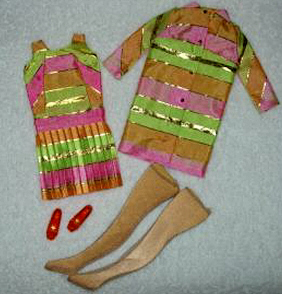 This ensemble has been found with three different style/color shoes, the reproduction has the orange bow shoes.